Atlantic Productions has revealed cutting-edge animations for Chicago's Field Museum's upcoming exhibit about Sue, the most complete T-Rex fossil ever discovered. The experience, which is expected to open on 21st December, is located in its own 5,100 sq ft private suite and will showcase Sue's life as it would have been in the Cretaceous period. To create the immersive animations Atlantic Productions worked closely with the museum's resident paleontologists: Dr Peter Makovicky, William Simpson and Dr Thomas Cullen, who were responsible for ensuring that every detail in the animation, down to the texture of Sue's skin, was scientifically accurate. 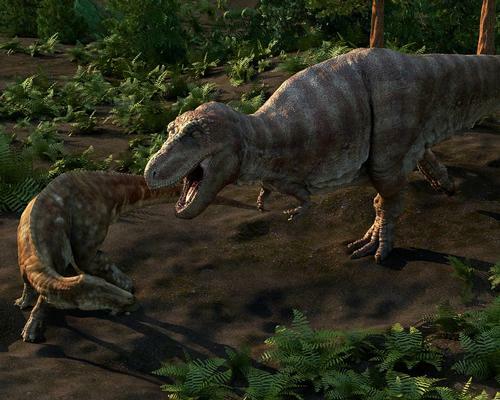 Depicting epic scenes of a dramatic clash between Sue and a triceratops, as well as Sue stalking a herd of Edmontosaurus, the animations are rendered in 6000 x 2160 pixels and are accompanied by custom soundscapes featuring environmental noises from the landscape. The animations will be displayed on six rear-projection screens, each measuring 49" by 106" and spanning a total width of 24ft 6". Anthony Geffen, CEO of Atlantic Productions, said: "The work builds on our long history of projects with the innovative US Museum sector which also include Giant Screen film and television documentaries." "We are enormously proud of these dramatic and visually stunning scenes. They form a perfect setting for this prestigious fossil which is the oldest, most complete and biggest T-Rex ever discovered." Taylor Peterson, digital project manager at the Field Museum, said: "The goal for this project was to bring Sue's world to life. The formidable presence and beautiful style of these animations allow our visitors to feel not only completely immersed in the environment but also witness a more updated version of what scientists think T-Rex looked like and how it behaved - we're incredibly proud to provide this experience as part of the new gallery design." Founded in 2014, Red Raion is the first VR movie production company in the attractions industry.